Heading west to Kingman, AZ! Got tired of looking out of the window here at home at all the snow piled up here in NJ and decided to head west to Kingman, Arizona, at least in spirit, by way of these two images. Ahhh... to be there now where the temperature on February 23, 2014 is seventy degrees and lots of sunshine. 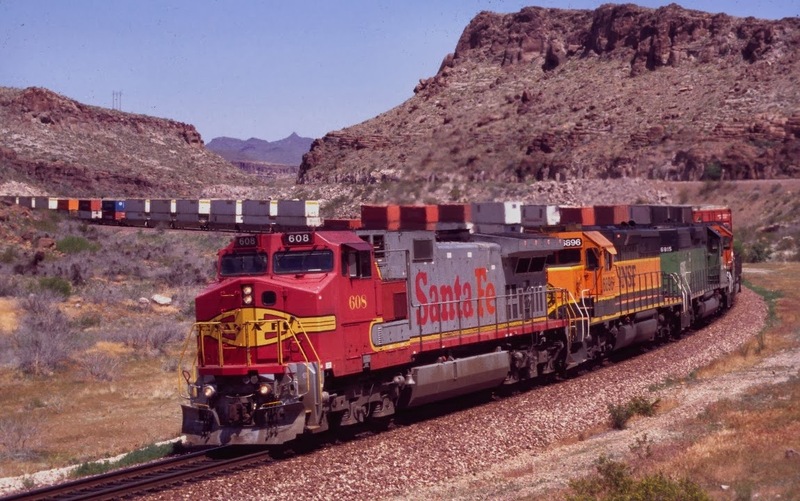 The first image has Santa Fe 608 leading BNSF 6896, BNSF 6815 and an unidentified fourth unit leading an intermodal through Kingman Canyon back in May, 2001. 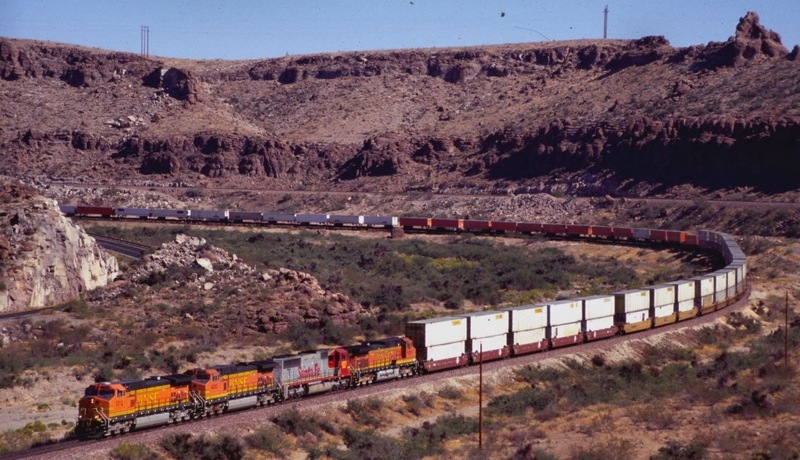 Taken from a higher elevation, still another intermodal with a power consist of BNSF 5313, BNSF 4313, BNSF 8211 and BNSF 4354 in October, 2001. The two-lane road seen off to the left is the historical Route 66. We would like to suggest you check the following web page for a variety of links to other web sites about trains. Although the title of the page is History of Train Travel, it only has a few brief comments on that topic. The real value is the treasure trove of links to other web sites. We would like to thank Kelsey, a high school volunteer at the Charlotte Library, for finding this web page. Good job of researching for an educational project at the library. JACKSONVILLE, Fla. - February 21, 2014 - CSX Transportation was on hand this week in Orlando, Fla., to support the Renewable Fuels Association's 19th annual National Ethanol Conference and to keep shipper awareness high of the company's transportation capabilities in this important market. "Even before The Energy Independence and Security Act of 2007, CSX has been actively supporting the ethanol industry and working with our customers and their receivers to ensure safe, efficient delivery of ethanol," said Clarence Gooden, executive vice president and chief commercial officer. "We look forward to continuing to work toward those objectives with both unit-train deliveries and single-car shipments." One of CSX's services is called EthX, an express ethanol delivery that is safe, efficient and cost effective. Through EthX, CSX moves 80-car unit trains to a network of 18 eastern terminals. But the company also handles smaller shipments with the same level of efficiency, said Kyle Hancock, vice president-industrial and agricultural. "The ethanol network has potential to grow, especially if gasoline blends include a higher percentage of ethanol," Hancock said. "Meeting our shippers and receivers face to face at the National Ethanol Conference is a great way to sustain and grow our business." Following article is from the Star-Ledger. Raritan Valley Line commuters next month will be able to get a trip into New York without having to transfer to another train in Newark, but for now the "one-seat rides" will only be offered on weekdays during off-peak travel hours, NJ Transit officials said today. The one-seat rides are scheduled to begin Monday, March 3, when the first of five daily roundtrips into and out of New York Penn Station is offered, beginning with train No. 5126, expected to arrive in New York at 10:09 a.m.
For now, the one-seat rides will be for trains arriving at New York Penn Station between 10 a.m. and 2 p.m. on weekdays, or trains leaving the station between 11 a.m. and 3 p.m. The way Raritan Valley Rail Coalition Chairman Peter Palmer sees it, the first step in a four-step process has been accomplished with the off-peak service on weekdays. Step two would be having any Raritan Valley Line train that leaves New York after 8 p.m. be a one-seat ride. Steps three and four — weekend service and full weekday rush-hour service — will not be as easy to accomplish, Palmer acknowledged. He noted that due to Amtrak train tunnel maintenance on weekends, only one tunnel is available for Jersey trains. But, Palmer said, "We achieved step one and we’ll keep working. We’ve only been doing this for 15 years." Commuters on the Raritan Valley Line make up nearly one-tenth of NJ Transit’s weekday train ridership of about 302,000. However, they haven’t been able to get a train to New York City without stepping off their diesel-powered train in Newark and transferring to an electric-powered one. Diesels don’t operate in the train tunnel under the Hudson River. For commuters, it was often aggravating to have to leave one train at Newark Penn Station and go down and up stairs to get to another one on a different platform. 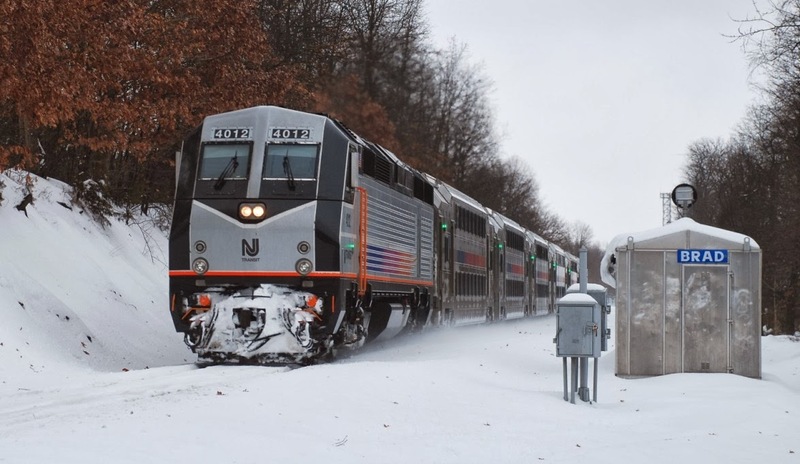 But NJ Transit now has dual-powered locomotives that can switch between diesel and electric power, allowing the long-awaited one-seat rides to happen. The Raritan Valley Line runs from High Bridge, in Hunterdon County, to Newark Penn Station, with stops in Annandale, Lebanon, White House, North Branch, Raritan, Somerville, Bridgewater, Bound Brook, Dunellen, Plainfield, Netherwood, Fanwood, Westfield, Garwood, Cranford, Roselle Park and Union. The transfer-free rides will originate from High Bridge as well as Raritan. In addition to the one-seat rides, there will be more capacity on the Raritan Valley trains. The train sets now have six double-decker cars plus a locomotive, but an extra multilevel train car will be added beginning March 3. The additional capacity for Raritan Valley Line customers is tied to the upcoming Pulaski Skyway rehabilitation project, which will limit lanes and close the Pulaski in the direction toward New York for about two years. One-seat rides cannot be offered at this time on weekends due to capacity restrictions at New York Penn Station that would require additional coordination with station owner Amtrak, officials said. ...will keep NJ Transit's trains from running close to their scheduled times on the Raritan Valley Line (RVL). NJT Train 5725 is running a few minutes late of its scheduled departure time of 1:59 from Raritan on February 13. It is seen here passing CP BOYD, just east of MP 37, on the RVL. Its next stop will be the North Branch station at MP 39.4. It should also be noted that off to the engine's right is where the tracks take returning trains directly into the Raritan yards. They are completely covered over by the snow. Here is another view of the same location dated 4-4-09. Received the following via email from one of our regular correspondents. What a clever and crazy conglomeration of coordinated carrying capacity (84 years ago, or even now)! A silent film clip, but it must have created quite a cacophony and echo of clatter as its flanges clicked and clacked whilst cleaving through curving track crossovers. A derailment would create a massive crisis and conundrum and require a call for several big cranes. Transport with this cantankerous caravan had to thus be continuously conducted calmly, coolly and with considerable care for the consigned cargo until terms of carriage were concluded. Film, less than 90 seconds. JACKSONVILLE, Fla. - February 12, 2014 - Earlier today, the board of directors of CSX Corporation (NYSE: CSX) approved a $0.15 per share quarterly dividend on the company's common stock. The dividend is payable on March 14, 2014, to shareholders of record at the close of business on February 28, 2014. Doors will open at 8:00 AM for coffee and doughnuts. The presenters will begin at 9:00 AM. The show will be presented at Christy Joy Catering Service, located on 141 Bulls Head Road, Pottsville, PA. The master of ceremonies for this event will be Mr. Al Barnes. 9:00 AM to 9:45 AM: Allen Keller, PRR in the Early 1960’s, My Experiences as a Locomotive Inspector for Remote Control Locomotives. 10:00 AM to 10:45 AM: Bob Warner, 1950s Steam Around Reading. 11:00 AM to 11:45 AM: Don Young, South African Steam. 11:45 AM to 1:00 PM: Break for lunch. Slides from the John Pritz Collection of Jersey Central and Reading Steam. 1:45 PM to 2:30 PM: Kermit Geary, Lehigh New England Railroad in General. 2:45 PM to 3:30 PM: Craig Werley, Kantner Slide Collection, The Conrail Era. There will be door prizes, raffles, and a limited number of vendors selling memorabilia . Lunch will be provided by Christy Joy Catering Service. The menu will be served buffet style and consist of the following: City chicken, ham, stuffed shells, mashed potatoes, stuffing, green beans and mixed homemade desserts. The cost is $30.00 per person. Seating is limited, tickets will be sold on a first come, first serve basis. Checks can be made payable to Project 113 and sent to Project 113, 113 East Sunbury Street, Minersville, PA 17954. For information phone: 570-544-8300 or email: rrproject113@hotmail.com. Starting at Minersville Station, proceed east on Seltzer Road 1 3/10 miles to Bulls Head Road, turn right onto Bulls Head Road, travel approximately 7/10 mile. Christy Joy’s Catering Service is on the right. There is plenty of off road parking on the grounds of the facility. JACKSONVILLE, Fla. - February 12, 2014 - Fredrik Eliasson, CSX Corporation (NYSE: CSX) executive vice president and chief financial officer, will address the Barclays Industrial Select Conference in Miami, Florida on Wednesday, February 19, at 8:05 a.m. Eastern Time. Access to the audio webcast will be available on CSX's website at http://investors.csx.com. A replay and accompanying audio will be available following the conclusion of this event. Due to extreme weather conditions shipments moving across the Midwest and Northeast have been experiencing delays of 24 to 48 hours. In addition, Winter Storm Pax is expected to contribute to snow and ice conditions across the Southeast and it is anticipated that traffic moving via these routes may also experience delay. In locations where extreme temperatures are combined with snow or ice conditions, some local service may be curtailed. Operations and Service Support are working with customers to coordinate local operations that may be affected. This email was lost for 2 months, sorry. Decided to see what progress has been made with the Royce Runner on what was a rather brisk Saturday morning (December 7th). The cantilever signal for westbound trains is up but not operational. All those WB signals are still covered with black plastic. For eastbound trains that signal can be seen to the right of the red COFC back in NS 22V's train. Motive power on this intermodal was NS 9491 and NS 7710 as it passed over the Roycefield Road grade crossing at 9:43. Within that same area and off to the left can be seen the new relay shed. Where the name will appear (CP ROYCE?) on the shed is still covered over. No idea as to when this project will become fully operational. Later on Saturday afternoon, decided to head out to Flemington to check out a new location to photograph BR&W's "North Pole Express". Saturday afternoon's run marked the first of seven runs to be made on December 7, 8 and 14. All of the excursions were noted to be sold out. Seen here, BR&W # 60 leads its consist west towards Ringoes over the First Neshanic River Bridge. NORFOLK, VA. – Communities around Norfolk and the Elizabeth River, a tributary of the ecologically important Chesapeake Bay, have benefitted from Norfolk Southern’s innovative stormwater management system at the railroad’s Lamberts Point coal transload facility. When it rains, the multimillion-dollar recycling system collects, filters, and treats stormwater from the 425-acre export coal facility. The water is reused to suppress dust and clean equipment at Pier 6, where oceangoing colliers are loaded with metallurgical and steam coal used to produce steel and electricity worldwide. In addition to enhancing the health of the river’s ecosystem by reducing stormwater runoff, the project conserves water and lowers the company’s water bill. Since the recycling system began operating in March 2013, the coal pier has reduced its use of municipal water by approximately 1.5 million gallons a month, annually saving about 18 million gallons. The railroad’s efforts have earned recognition from the Elizabeth River Project, a nonprofit conservation organization whose goal is to restore the river’s water quality. The ERP in January presented Norfolk Southern with a 2013 “Sustained Distinguished Performance” award for the stormwater project, the second consecutive year the railroad has achieved the award. The railroad is a “Model Level” partner in the ERP’s River Star Business program, the highest level for businesses. Blair Wimbush, NS vice president real estate and corporate sustainability officer, said the stormwater project demonstrates the railroad’s commitment to corporate responsibility. Norfolk Southern constructed stormwater retention ponds at the Lamberts Point facility in 2000. The latest upgrade, an approximately $5-million investment, added a 10,000-gallon holding tank, a “Hydroclone” filtration system to remove fine coal particles, and a carbon and ultraviolet light treatment system that neutralizes microorganisms and other potential pollutants. The water then is ready for use in the coal pier’s operating processes. 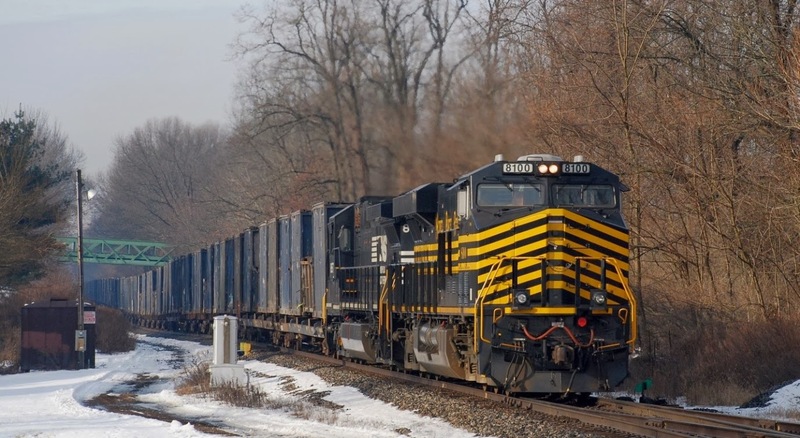 To learn more about how Norfolk Southern contributes to a cleaner environment, a healthy economy, and safer communities, visit www.nssustainability.com. The GSD will be carefully tracking the forecast for a weekend winter storm and will announce via email and on our website by late Friday night if the meet is being postponed. We will be considering round-trip traveling conditions, parking considerations and access to our layout owners' homes. Please check throughout Friday evening for any change in Saturday's meet status. If necessary our new date will be in two weeks, Saturday, February 22nd @ 9 am in Scotch Plains. "Bring 'n Brag" AP Judging Door Prizes "White Elephant Table"
See eight 'work-in-progress' clinics and visit FIVE great area layouts. Dining and layout tour maps will be provided at the meet. Centrally located with easy access from Routes 22, 78 and the Garden State Parkway, plus ample off-street free parking. Due to extreme weather conditions shipments moving across the Midwest and Northeast may see delays of 24 to 48 hours. In addition, Winter Storm Nika is expected to contribute to snow and ice conditions. In locations where extreme temperatures are combined with snow or ice conditions, some local service may be curtailed. Operations and Service Support are working with customers to coordinate local operations that may be affected. The weekend's "balmy" temperatures and sun provided definite relief after having to deal with a stretch of cold weather, snow and gray skies that has been prevalent here in central NJ. Waiting in Manville (NJ) to photograph NS 24K being re-routed down CSX's Trenton Line and soaking up the sun's rays, I didn't mind the wait for the CSX crew to start their trip down to Morrisville (PA). NS 2584 and NS 7516 served as the power when 24K came down the LEHL. For the reverse move at Port Reading Jct, NS 8383 (ex-CR 6170) would serve as the leader with NS 9053 following as it went through Manville yard. On Sunday NKP 8100 was the leader on 67J, a empty trash train, as it made a return trip down the LEHL. One week earlier on January 25th NKP 8100 was the leader on NS 22V. 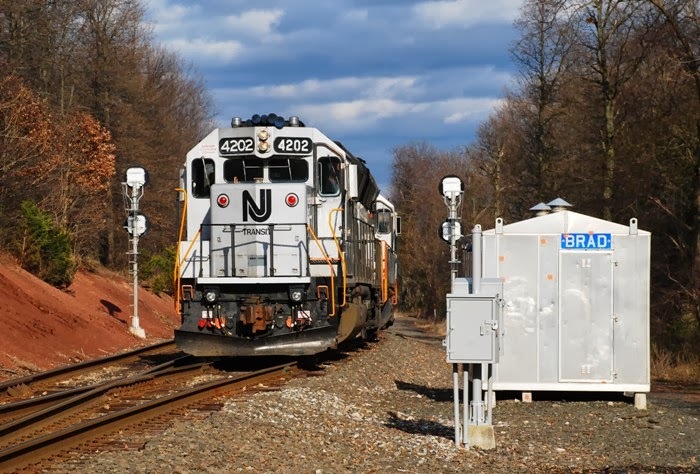 It is seen here at Bloomsbury (NJ LEHL MP 68.8) preparing to cross NJ's Musconetcong Mountain range as it heads east to Oak Island. With February 2nd also being Groundhog Day, Punxsutawney Phil the Groundhog has seen his shadow! The means we are in for another six weeks of winter! On Monday, central NJ is forecasted to once again have wintery conditions with three to five inches of snow and sleet predicted. Oh well, so much for the end of winter. The TRI-STATE RAILWAY HISTORICAL SOCIETY, INC.
Tri-State continues its 50th Anniversary year by featuring long-time members as presenters. For Thursday, February 13th, we'll feature some classic movies from avid railroad film collector Mitch Dakelman. First will be film called "GG1: An American Classic." During the final weeks of GG1 operation in 1983, Mike and Marianne Autorino, of Avanti Productions, documented GG1 4877. It was the pride of the fleet as the only one remaining still in a heritage paint scheme, the attractive Tuscan red that was developed in 1952 to run with Pennsy's new and luxurious Congressional. Mike, who passed away in November 2013, mounted cameras on the "motor," to provide dramatic angles rarely seen by a traveler. Cliff Underwood, a veteran PRR engineer, wrote a song called "Big Red," which is heard throughout the film by a local musical group. 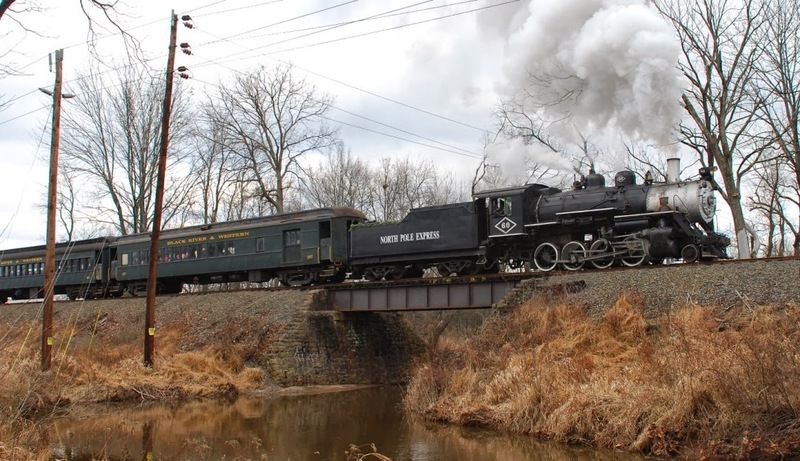 Expertly narrated by well-known NRHS member and professional voice-over artist Tom Moran, this is a great story about a legendary engine, filmed in color and with on-location sound. The GG1 4877 in this film is in the URHS collection in Boonton, and has recently be restored to its original Brunswick Green and gold stripes. This film is one of the best-done efforts from anyone in the railroad field, and it's worth a look. Next we'll see "Raymond Loewy, Industrial Designer." Loewy's design work was everywhere in the 1930s and '40s, and he's the man who improved the look and design of the GG1s. He designed everything from automobiles to the Princess Phone to Spacelab (in 1979). Loewy was interviewed on a 60 Minutes program, and the segment was sold by CBS to school and public libraries for additional screenings. Mitch was able to acquire a 16mm copy on eBay and will be pleased to run the film for the audience. We'll be watching vintage films on a vintage project projector, as these films were meant to be seen. This is a program not to miss. 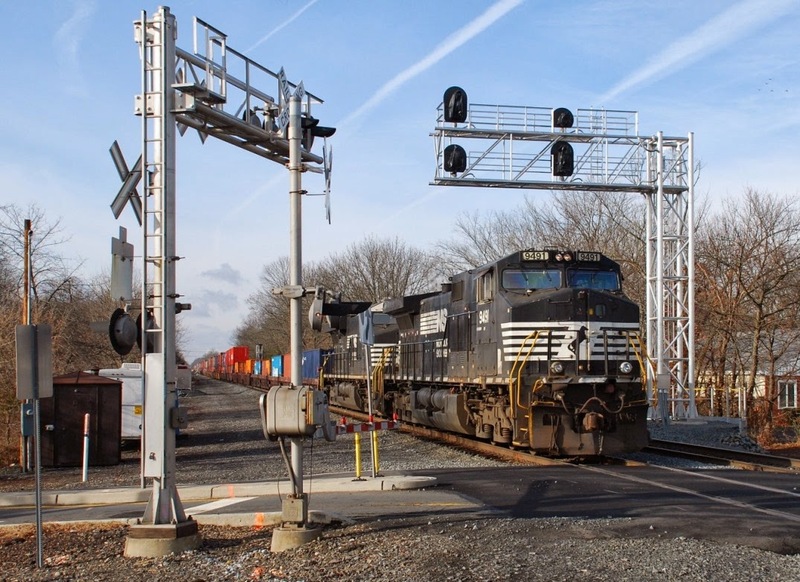 CHESAPEAKE, VA. – Norfolk Southern has opened a new Thoroughbred Bulk Transfer terminal in Chesapeake. Thoroughbred Bulk Transfer (TBT) terminals are specialized facilities that allow customers to transfer a large array of commodities between rail cars and trucks. TBT terminals are owned by Norfolk Southern and operated by independent contractors that are industry experts in facilitating safe and efficient bulk transfer and distribution. The facilities allow customers without rail sidings to receive the benefits of rail economics and service quality. Less than three miles from downtown Norfolk, Va., with convenient access to Interstates I-264 and I-464 at 1305 Atlantic Blvd., the Chesapeake TBT also enjoys close proximity to rail-serving yards on Norfolk Southern’s high-density main line. The terminal can handle dry and liquid bulk food-grade commodities such as flour, sugar, grains, and plastic pellets, as well as aggregates, sand, and cement. It is located on 40 acres with seven acres of laydown area, with expansion capability to handle lumber, dimensional products and accommodate container stuffing. The facility features 104 car spots, a certified truck scale, and is fully paved, fenced, and lighted. The Chesapeake TBT is strategically positioned to serve Hampton Roads-served markets as well as markets overseas with its close proximity to nearby container terminals. Norfolk Southern has a network of 32 TBT facilities in 17 states. The new Chesapeake terminal is operated under license by RSI Leasing Inc. More information on Norfolk Southern’s transload network is available at www.nscorp.com/distributionservices.